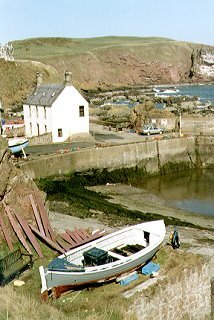 Located on the east coast of Scotland 3 miles (5 km) northeast of Eyemouth in the old county of Berwickshire, St Abbs is a pleasant fishing and holiday village, formerly known as Coldingham Shore. It also serves as a centre for underwater diving owing to its exceptionally clear waters. Nearby to the south is Coldingham beach and, to the N, St Abbs Head, a nature reserve with a large colony of seabirds. A nunnery was founded here in the 7th Century by St Ebba (or Ebbe), daughter of Ethelfred, and the lighthouse was built by Robert Louis Stevenson's father and uncle (c.1861). Also nearby is the 14th century chapel at Kirk Hill, and Renton House, an early Georgian mansion. Fast Castle, 3 miles (5 km) north and 21m (70 feet) above sea level, was the meeting place of the Gowrie conspirators who plotted against James VI, and was written about as the keep of Wolf's Crag in Sir Walter Scott's novel The Bride of Lammermoor. The castle was destroyed in 1515 and rebuilt six years later; it had a drawbridge over a chasm 7.3m (24 feet) wide.